At the time of his death, Reverend Isaac Williams Wauchope had published historical, educational and political articles, as well as travelogues, poems and letters in his own name and under several pseudonyms: Silwangangubo, Dyoba, woDaka and Ngingi. Wauchope was born in Doornhoek near Uitenhage in 1852, the eldest of 10 children and born into a family with strong connections to the early Christian missionaries in the Eastern Cape. As a young man, he was one of four pupils at Lovedale Institute to accompany a missionary party to Malawi in mid-1876, but he caught a fever and was sent home in December. He worked as a teacher in Uitenhage and, in September 1882, played a key role in establishing Imbumba Yamanyama, one of the earliest political associations for blacks in South Africa. The organisation was formed in response to the creation of the Afrikaner Bond (League) in 1879, which sought to advance the interests of Afrikaans-speaking white South Africans. Wauchope and his wife moved to Port Elizabeth where he worked as a clerk and interpreter to the magistrate. Through his active community involvement, his work with Imbumba and two court cases in which he challenged abuse by white officials, he earned himself a reputation among black South Africans as a "public benefactor". In 1888 Wauchope responded to a call for "native" ministers and studied theology at Lovedale where he became an active member of the Lovedale Literary Society. On March 6, 1892 he was ordained as Pastor of the Congregational Native Church of Fort Beaufort and Blinkwater. From 1906 Wauchope joined the movement to create an institution of higher learning for black South Africans. Ten years later, in 1916, these efforts culminated in the foundation of the South African Native College, now the University of Fort Hare. A controversial case brought Wauchope to Cape Town on the eve of the declaration of the Union of South Africa. In 1907, after administering the estate of a parishioner for 18 months, Wauchope filed a will in his own handwriting and with the signatures of two witnesses. He was charged with forgery and was defended by RW Rose-Innes. Despite there being no evidence that Wauchope had profited in any way from the will, or any indication of his intention to defraud, an all-white jury found him guilty and he was sentenced to three years' hard labour at Tokai prison. In March 1911, while Wauchope was still in prison, his wife died. He was released after two years in 1912. Four years later he volunteered for the South African Native Labour Corps and signed on as clerk/interpreter. The men of the Native Labour Corps were to serve in France unarmed, helping to dig, move and build as part of the Allied effort in World War I. This consignment was the last of a total of 10 000 black South Africans who responded to a British request directed in 1916 to Prime Minister Louis Botha, the former Boer War general, for troops to serve as labour battalions in France. Prior to embarkation, the SA Native Labour Corps was encamped at the Cape Town showgrounds, where it conducted its drills, beneath the slopes of Devils Peak on land that now forms part of the Kopano Residence soccer fields at the University of Cape Town. The SA Native Labour Contingent set sail from Cape Town on a mid-summer's day on January 16 1917. Almost a month later the troops were nearing their French destination in icy winter temperatures. During the night of February 21, the weather worsened and the SS Mendi and reduced speed and sounded its siren through the fog. The Mendi was a 370-foot ship that had served on the Liverpool to West Africa route until she was chartered by the British government in 1916. The ship was commanded by Captain Henry Yardley. A few minutes before 5am, while most men were still sleeping in their bunks, another ship, the SS Darro, emerged from the fog and rammed the Mendi at full speed. Many of the men were crushed to death as they slept in their bunks or were drowned as water poured into the gaping hole in her side. Within 20 minutes she sank. In the shock and confusion, Wauchope emerged as a remarkable figure. Numerous survivors testified to the lack of panic on board, attributed in large part to Wauchope's actions as he encouraged his fellow soldiers to assemble calmly on deck for a "death drill" and to die like African heroes. "Be quiet and calm, my countrymen, for what is taking place is exactly what you came to do. You are going to die, but that is what you came to do. Brothers, we are drilling the death drill. I, a Xhosa, say you are my brothers. Zulus, Swazis, Pondos, Basothos and all others, let us die like warriors. We are the sons of Africa. Raise your war cries my brothers, for though they made us leave our assegais back in the kraals, our voices are left with our bodies..." (quoted by Jacob Bam, 1936: 29). Oral history accounts say that those left on board removed their boots and stamped the death dance on the slanting deck of the sinking ship, far from home in the English Channel, but united, irrespective of ethnic origins. No steps were taken by the Darro to lower lifeboats or to rescue the survivors. She stood off and floated nearby while crew in lifeboats from Mendi's escorting destroyer, HMS Brisk, rowed among the survivors, trying to rescue them. Of the 805 black troops on board, 607 lost their lives along with nine of the 21 white officers and 31 of the 69 crewmen. Among the dead troops were prominent men such as the Pondoland chiefs Henry Bokleni, Dokoda Richard Nadamase and Mxonywa Bangani. On receiving the news of the disaster on March 9 all the members of the South African House of Assembly, led by Botha, rose from their seats as a token of respect. Despite this gesture, though, black servicemen returning home from the war received none of the customary acknowledgements of service abroad, such as a ribbon or medal, that were accorded to white servicemen and women. The corps returned home in September 1918, although some hid and never returned to South Africa, choosing rather to stay in France and England where they could live without an official colour bar. In 1986 the South African government gave formal recognition to the service of the SA Native Labour Corps by unveiling a bronze plaque at the museum at Delville Wood in France which showed the sinking of the Mendi. 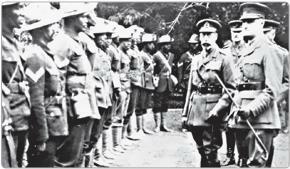 In its death notice on April 3, 1917, the Eastern Cape newspaper, Imvo, recorded that Wauchope was a man of distinction. He had been active and prominent in church, political, community and educational affairs. He had led the black temperance organisation (the Independent Order of True Templars) for five years from 1893 to 1898 and had contributed numerous newspaper articles on religious themes, criticising those who drank. In May 1882 his first poem was published exhorting his readers to transfer the heroic resistance of their forefathers from war to rational argument and the strength of the pen. In 1912 Imvo had published a collection of Wauchope's poems, titled, "Ingcamango Ebunzimeni" (Reflections in Darkness), and written while in prison in Tokai - to date the only prison literature in Xhosa. His 1908 book, The Natives and their Missionaries, is his only formal publication.